Wall Street is undoubtedly a safer place since the financial crisis, but dangers are creeping back into the market. That's according to a report to Congress released Tuesday from the Treasury Department's Office of Financial Research, which found that the financial system has become more vulnerable since last year. The report, which is required annually under the Dodd-Frank financial reform law, focused on increased risk taking and a growing lack of transparency in the past year. 1. 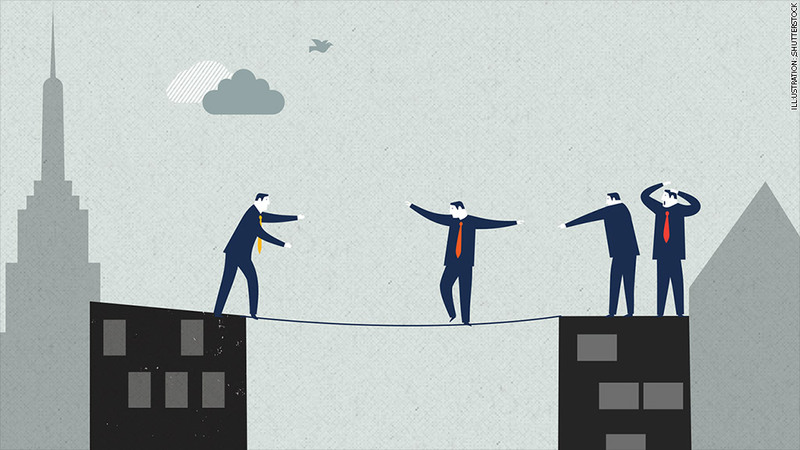 Risky business: Investors are ramping up the risk, but they may have no other choice. Persistently low interest rates nurtured by the Federal Reserve have compelled investors to search for higher returns in scarier places. Related: What's keeping bond investors awake at night? Such hazard zones include corporate junk bonds, the debt of shaky European economies, and emerging markets stocks, the Treasury asserted. These investments could blow up in investors' faces once interest rates rise. 2. Not enough cash: Liquidity is the grease that keeps the market's wheels turning. But the Treasury is worried that there won't be enough of it should things get ugly for the markets. While regulators have worked tirelessly in recent years to get banks to bulk up on their cash reserves, the report raised the possibility that such capital requirements could restrict banks' ability to make loans and trade . It also cautioned that less liquidity could stymie the activities of money market funds during periods of stress, exposing them to fire sales where investors are forced to sell assets at deeply discounted prices. Such funds froze up during the 2008 market crash, which greatly exacerbated the decline. 3. Opaque dealings: Technological innovation is almost always a good thing, except when it makes the financial world less transparent, the Treasury claimed. It cited the rise in recent years of high speed trading, where super fast computers trade a large number of stocks mere milliseconds. So-called "Dark pools," or trading venues in which buyers and sellers are matched without going through a traditional exchange, are also worrying, since trades are facilitated outside of public view.